Frazier's Farm or Frasier's Farm? While working on my images for General Lee's Immortals, I made an interesting discovery. There is inconsistency on the spelling of Frazier's farm. Ok. There are a lot of inconsistencies on spellings in that time period. But this inconsistency happens to be on battle flags. In December 1862, Branch's brigade received new Army of Northern Virginia battle flags. 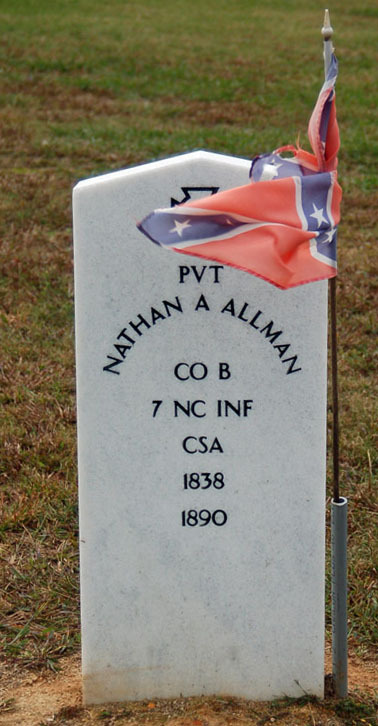 These flags had their battle honors painted in white paint, in a very distinctive pattern. Of the five flags issued, four survive. The fifth flag, belonging to the 7th North Carolina State Troops, was cut up at the end of the war near Lexington, North Carolina. 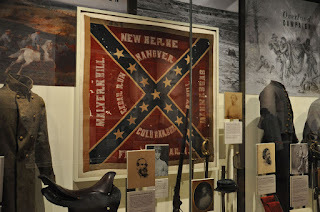 A scrap of this flag survives at the North Carolina Museum of History in Raleigh. On this particular issue of flags, the June 30, 1862, battle (a part of the Seven Days Campaign), is spelled "Fraziers Farm." However, in a later issue of Army of Northern Virginia flags to the 28th North Carolina Troops (May 1864), it is no longer" Fraziers Farm," but it is now "Frasiers Farm." 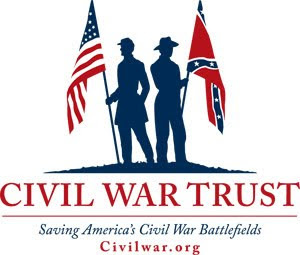 This flag was captured on July 28, 1864, near Malvern Hill, Virginia. A replacement was issued shortly thereafter. This 28th North Carolina flag has been further modified. Now, the battle honor reads "Frasers Farm." 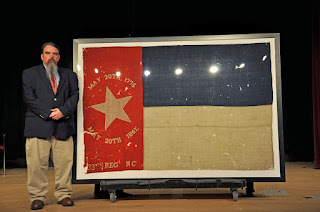 This flag was surrendered on April 9, 1865, at Appomattox Court House. So our next question is why? 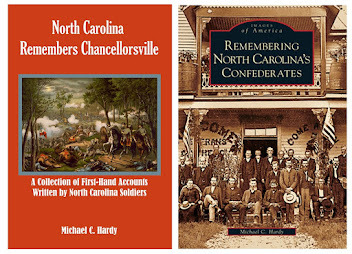 Why did the lettering on two different flags issued to the 28th North Carolina, get misspelled, once with "Frasier's Farm," and the next time with "Frazier's Farm." Just who was painting these flags on these two different days? 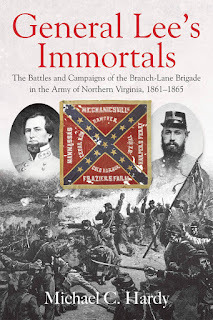 Now taking pre-orders for General Lee's Immortals! 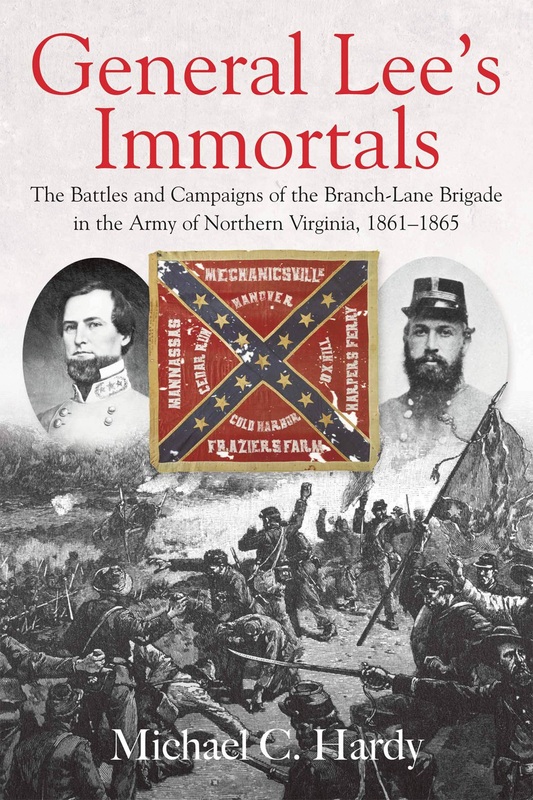 Ladies and Gentlemen, boys and girls, I am happy to announce that General Lee's Immortals: The Battles and Campaigns of the Branch-Lane Brigade in the Army of Northern Virginia, 1861-1865, has gone to the printers! The expected release date is January 12, 2018! 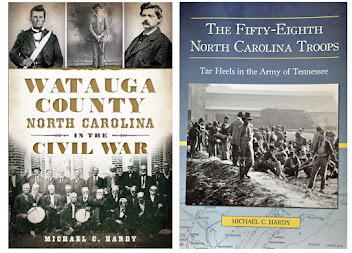 My first regimental, a history of the 37th North Carolina Troops, came out 15 years ago. I never thought I would get the opportunity to write about the brigade itself. But four years ago, I took a chance and dropped a note to Ted Savas, asking if his company would be interested in publishing such a book. He said yes, and we will all see the finished product in just a few weeks. Writing a brigade history is hard - you cannot put in every example you might come across in your research, only the best one or two. And trying to decide which stories are the best is a challenge. 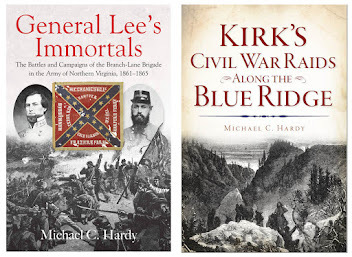 I did something different in General Lee's Immortals than what I did previously in my histories of the 37th North Carolina and 58th North Carolina. 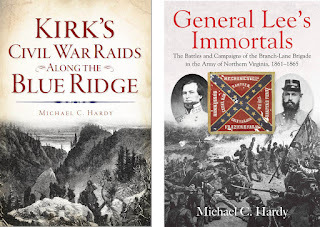 Not only does General Lee's Immortals follow a chronological history of the Branch-Lane brigade, from their creation right after the battle of New Bern to the surrender at Appomattox, but I also created themed chapters as well. 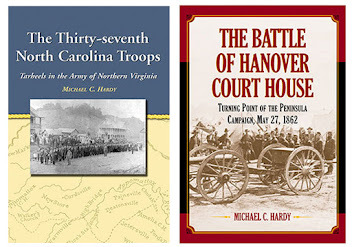 There are chapters on brigade medical care; camp life; prisoners of war; and military discipline. Instead of having that material spread out over the text, I was able to concentrate on these topics, showing how brigade medical care (for example) changed over the course of the war. This was something new for me, and I do not recall seeing it in any other brigade history. That brings me to another point: I wanted this history of the Branch-Lane brigade to be more than a brigade history. I wanted to try and show how a brigade worked (or sometimes did not work) throughout the war. I'm quite certain a book like that does not exist. So much of my writing life seems to have been wrapped up in the Branch-Lane brigade. A regimental history, a battle history (Hanover Court House), articles for magazines and newspapers. I've blogged about it, spoken in cemeteries when grave markers have been dedicated, and participated in living histories at national parks. 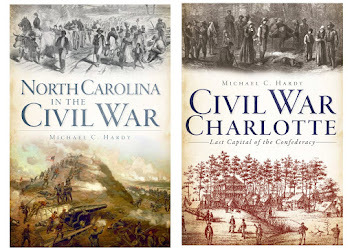 You could also say that books like Civil War Charlotte: Last Capital of the Confederacy and Watauga County, North Carolina, in the Civil War are products of my research into the Branch-Lane brigade. 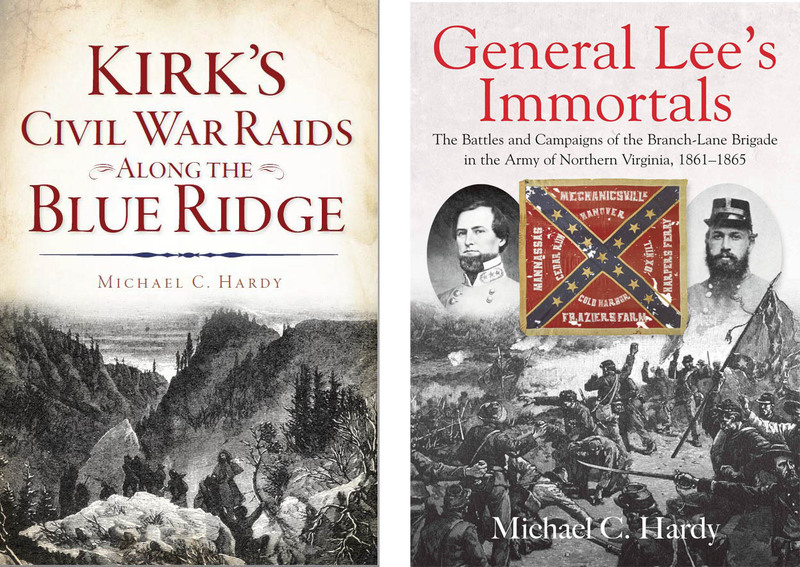 General Lee's Immortals: The Battles and Campaigns of the Branch-Lane Brigade in the Army of Northern Virginia, 1861-1865... 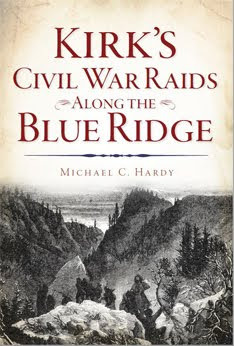 I look forward to signing a copy for you next month, and I really look forward to continuing the discussion about a remarkable group of men that served in Robert E. Lee's Army of Northern Virginia. Please pre-order a copy today! A milestone - this marks my 1,000th blog post! It took me eleven years to reach this post. What a journey! And, thanks for sharing it with me! Eleven years ago, I set out in the blogging world. Blogs were not new then, and with all the material out there, I wondered how I might contribute something new. So, I decided to focus my blog on what I knew the most about: North Carolina's role during the Late Unpleasantries. At times, I've used the blog to share where I am traveling, or what I am writing about. At other times, I've shared questions, looking for answers to some of history's mysteries. (Trust me, after 20+ years of researching and writing, I still have more questions than answers). One thing I am still sure about is this: we still know so little about our own history. Time after time I have stood in the great libraries of our state and not been able to find the answer to some little question that I have. So what is in store? I'm still researching and writing away. 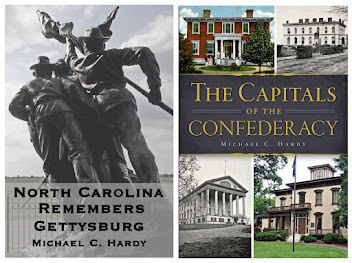 I have two new books coming out in the next twelve months. I'm continuing my research into the life of Chief Justice Richmond M. Pearson. And, I plan to continue letting you have glimpses into my world through the pages of this blog. Many blogs that I once followed have grown dormant over the years. But I believe that I still have something to say, something to share, and I look forward to getting your feedback as we share this journey together.